JOHNSTOWN — Amya Naja had two goals and an assist to help South Glens Falls to a 5-1 victory over Johnstown in a Foothills Council girls soccer game Tuesday at Johnstown High School. Aly Fish had a goal and two assists for the Bulldogs, who led 3-1 at the half. Marlee James and Ginger Kohanek also scored for South Glens Falls, while Vivian Picerno and Holly Page each had an assist. Deme Kellogg (5 saves) and Molly Rafferty (4 saves) shared the win in goal. Jenna Thompson scored the lone goal for Johnstown. Hope Buboltz made 16 saves for Johnstown (0-1 overall, 0-1 Foothills). The Lady Bills are scheduled to host Gloversville on Thursday at 7 p.m.
GLENS FALLS — Sydney Loux, Michaela Ponticello and Angel Anderson all scored two goals to help Gloversville to a Foothills Council victory over Glens Falls. Taylor Mee and Katie Callen also scored for the Lady Dragons. Loux also had two assists for Gloversville (1-0 overall, 1-0 Foothills), while Josie Wood, Kendra Lavery, Meredith Dennie, Ponticello, Callen and Anderson all had one assist. Stephanie Mehan scored the lone goal for Glens Falls. Katie Hastings made one save for Gloversville (1-0 overall, 1-0 Foothills), which travels to Johnstown on Thursday for a 7 p.m. game. Makayla Bennett made 12 saves for Glens Falls. The game was called in the 74th minute due to excessive heat. 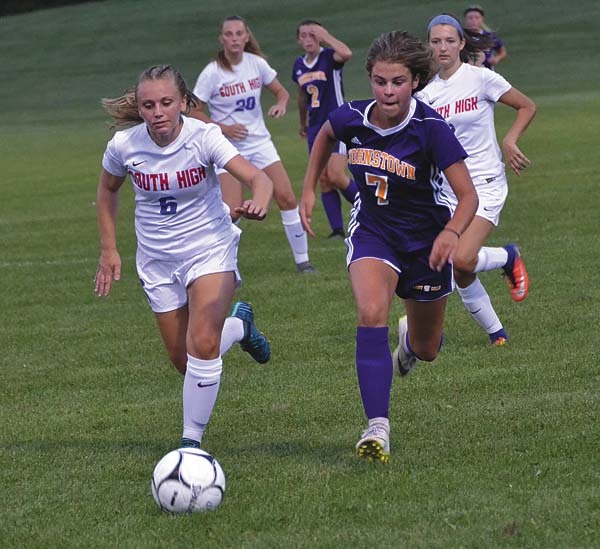 BROADALBIN — Hailey Parrotti scored twice to help Broadalbin-Perth post a Foothills Council victory over Hudson Falls at Patriot Field. Maria Stewart had a goal and two assists for the Lady Patriots, while Rose Barnhart added an assist. Morgan Rossi made just one save to earn the shutout win in goal for Broadalbin-Perth (1-0 overall, 1-0 Foothills), which hosts Fonda-Fultonville on Thursday in a non-league contest at 7 p.m.
Abra LaFontaine made five saves for Hudson Falls. AMSTERDAM — Bridgid Duffy finished with two goals and an assist to power Queensbury to a Foothills Council victory over Amsterdam at Lynch Literacy Academy. Kylie Potter had a goal and an assist for the Spartans, while Christina Cummings and Izzy Dennison also scored. Sophia Keshmiri added an assist for Queensbury. 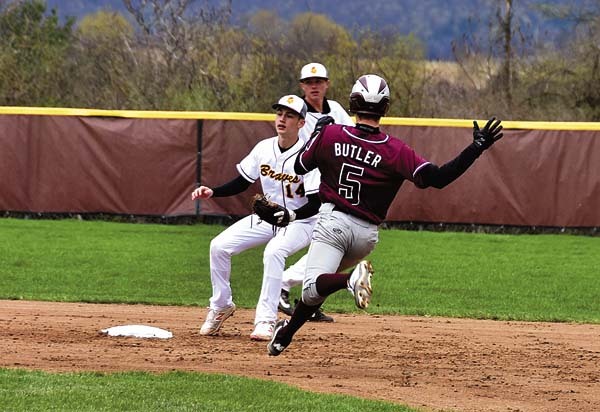 Jarey Aponte made eight saves for Amsterdam (0-1 overall, 0-1 Foothills), which is scheduled to host Scotia-Glenville on Thursday at 4:30 p.m.
CANAJOHARIE — Abby Smith scored the game’s only goal to lift Canajoharie to a non-league victory over Oppenheim-Ephratah/St. Johnsville in the season opener for both teams. Hunter Pitcher made six saves to post the shutout win in goal for the Lady Cougars (1-0 overall), who are scheduled to travel to Fonda-Fultonville today for a 7 p.m. contest. Ashley Shelmandine made four stops for OESJ (0-1 overall).